Collaboration has been at the core of Evergreen since we began in 1991. Since its inception, Evergreen has been moving bold ideas into action in communities across Canada through research, bringing expertise to the table, scaling and collaboration that lead to long lasting change. With more than 80 projects currently on the go, we continue to connect government, industry leaders, academics, Canadian innovators and residents to transform spaces into amazing public places. Many of our programs and projects are created in partnership with municipalities or by engaging residents in how their cities can be built. This Housing Action Lab is a collaborative project promoting innovative housing solutions for the Greater Toronto Area. There have been many spinoffs and continued action from this research. In 2016, members of the Housing Action Lab came together to develop a similar initiative called the National Housing Collaborative (NHC) designed to bring together housing stakeholders from across the country to inform the development of the Government of Canada’s National Housing Strategy. In 2018, building on our work with City of Hamilton, York Region and the City of Toronto, Evergreen developed a web-based tool to further demystify real estate across Ontario. The Affordable Housing Calculator was released this year. 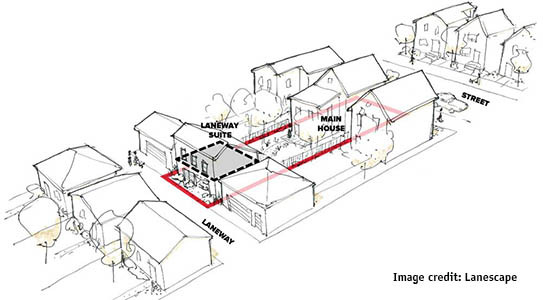 Utilizing the Housing Action Lab, Evergreen brought its expertise in facilitation, engagement and knowledge of housing issues to the table to look at laneway suites in Toronto. Laneway suites present the opportunity to increase rental supply within established neighbourhoods without changing the look, feel or character of low-rise residential streets. They have the potential to make home ownership more affordable, offer multi-generational living and increase safety by adding bright lighting and more eyes on the street. These benefits were also met with concerns about the complexity of implementation and anticipated demands on City staff and resources. In 2015, Evergreen, along with Lanescape, Councillor Mary-Margaret McMahon (Ward 32, Beaches-East York) and Deputy Mayor & Councillor Ana Bailão (Ward 18, Davenport) formed the core team driving the issue in Toronto. Our process had four main components: public engagement, consultation with internal city staff and political leadership, release of consultant report and political response. In 2017, Councillor McMahon and Deputy Mayor Bailão passed a motion that required city staff to consult and report back on implementing a laneway suites initiative in the Toronto and East York District. Neighbourhood Nature Play is a project created in partnership with the municipality of Kitchener, Ontario aimed at getting children and their families to play and learn in nature. Launched in 2017, children are invited to two Kitchener parks and, with the help of Park Animators, are encouraged to play freely, to invent and build using their own creativity and problem-solving skills, all while developing an appreciation for the natural world. This year, Kitchener will unveil the physical transformation of these parks into spaces that further encourage outdoor play and learning. Evergreen Brick Works has become a demonstration hub for Evergreen to scale our projects. We’ve been able to workshop and edit programs which have been adapted in cities around Canada. One of our longest standing partnerships and largest educational initiatives, the Learning Grounds program continues to help Canadian students and teachers transform their school grounds into healthy places to learn, play and connect with nature. It’s a program that has helped hundreds of schools and thousands of students. What began at Evergreen has become a step-by-step guide that can be implemented anywhere around the world. Launched in May 2018, Future Cities Canada is a national cross-sector initiative with the mission to accelerate innovation to transform cities for the benefit of all. Drawing on the expertise of its founding organizations – Evergreen, McConnell Foundation, Community Foundations of Canada and La Maison d’innovation sociale - and with a diverse and growing network of partners, brings together people, ideas, platforms and innovations from across sectors to address two of the most pressing issues of our time: inequality and climate change. Future Cities Canada is hosting the inaugural Realizing Our Potential: Future Cities Canada Summit November 7-9, 2018 where city leaders and urban innovators will share solutions on how to build our cities for people to live and thrive now and into the future. One of our biggest endeavours yet, Evergreen is convening this international gathering at the new TD Future Cities Centre at Evergreen Brick Works.